Taiyo Yuden has launched its 1005-size three-terminal multilayer ceramic capacitor A3K105BBJ106MR (1mm x 0.5mm x 0.5mm, with height as the maximum value, capacitance of 10μF, and rated voltage of 4V). Three-terminal multilayer ceramic capacitors, which have a lower ESL than the popular two-terminal multilayer ceramic capacitors, can reduce impedance in the high-frequency range and add to the stable performance of ICs that are driven at high speed. 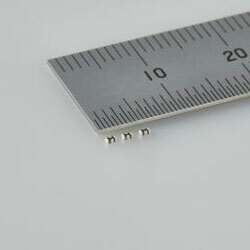 The thickness of the new capacitor has been decreased by approximately 23% compared to the company’s conventional product, A3K105KBJ106MV (1mm x 0.5mm x 0.65mm, with height as the maximum value), adding to the further reduction in thickness of small, thin digital devices. This product is used as a decoupling capacitor for power supply lines for ICs in answer to demand for smaller and thinner devices, such as IoT-related devices, such as smartphones and wearable devices.